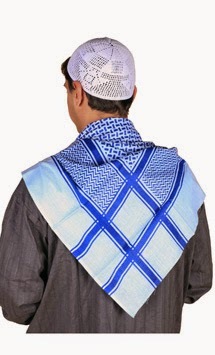 EastEssence- Online Islamic Store: How to Drape a Men's Islamic Scarf in Different Styles? How to Drape a Men's Islamic Scarf in Different Styles? Clothes are one of the most important attributes for building unique identity of a culture around the world. Though the discrepancy in a women's clothing is more prominent in every religion, this does not hold static for men of every religion. However, Islam is one culture, where you can easily spot the difference in men's clothes as well. When it comes to men's Islamic wear, there is a wide-array of options, including men's scarf, taqiyah, aba, throbe and much more. One of the most important clothes for men in Islam is an Islamic scarf - it is a cotton square scarf and generally folded in a triangular shape while wearing. There are different styles of wearing a men's scarf, below described are some of the styles that look elegant and can be worn on different occasions. The simple look: Even when wore in a very simple way, an Islamic scarf looks elegant. Just throw one end on the opposite shoulder and here you go. Similarly, you can wear the scarf by putting a left end to the right shoulder and right end to left shoulder for simple and graceful look. Throwing both the ends on opposite shoulder is quite good to wear in winters as this style keeps you warm. The big shot look: Usually, big officials wear an Islamic scarf in this style. Fold the scarf from the centre, middle of the forehead and leave the ends on the shoulder. Wearing this style gives a royal look to the wearer. The professional look: Wearing an Islamic scarf for a professional look is extremely simple. Simply leave the scarf flow down, but behind the back. Also, when you wear it in this way, you will feel free and comfortable. Look for the youngsters: Today, youngsters are more inclined towards fashion, and that is essential but tradition is equally important. They can wear a men's scarf in a modern way by putting one end in front of the opposite shoulder and leave the other side at the back. These are some of the major styles of wearing a men's Islamic scarf. You can use an igal to keep the scarf in place while draping these styles. Also, people wear taqiyah - a small white cap that helps to keep the scarf from slipping off the head, along with it. You can get different types of men's Islamic wear from both online shops as well as street markets, but make sure you buy them only after checking its quality. For More Information, visit : EastEssence. This is great. People generally drape a scarf which is folded in a triangular shape. The other styles mentioned will change the look of the wearer for sure.